Santa Clarita City Council Members, 1987 to Present. Santa Clarita City Commissioners, 1988 to Present. Santa Clarita City Council Election Results, 1987 to 2012. Santa Clarita City Council Election Results, 2014. General Election Results, Nov. 8, 2016: State, Local (City: Kellar, Smyth). City of Santa Clarita Map • Including Annexations through 2016. Video - City of Santa Clarita: The 20 Year Story • 2007. City of Santa Clarita 1987-2007: Celebrating 20 Years of Success (Book 2007). Looking Back: City's First Mayor Buck McKeon Remembers by Buck McKeon, 2007. Nearly Two Decades of Battling Elsmere Pay Off By Marsha McLean, 2007. 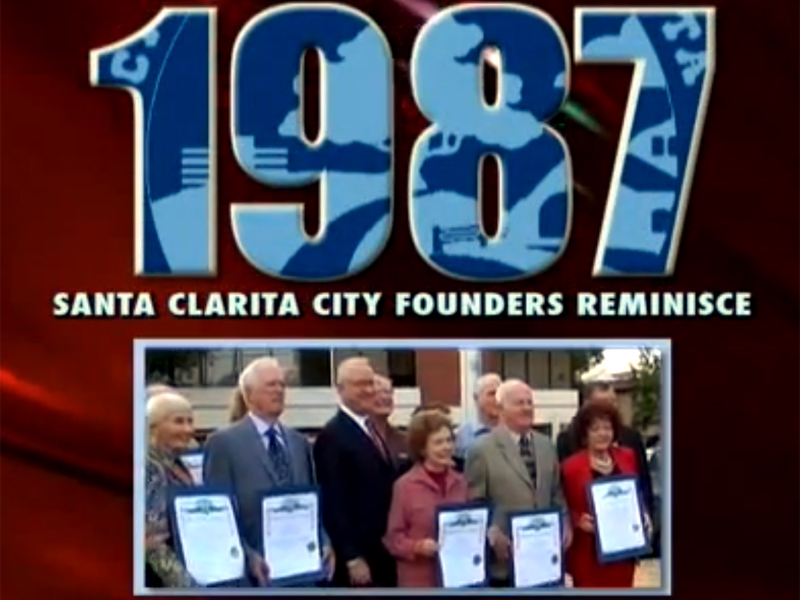 Video - Santa Clarita City Founders Reminisce • SCVTV 10-19-2009. City of Santa Clarita Public Library Annual Report, FY2012-13 • 8-27-2013. Video - City of Santa Clarita: 2013 in Review • City of Santa Clarita, 12-20-2013. Video - Santa Clarita 2015: A Virtual Tour • City of Santa Clarita, 8-17-2015. Video - Santa Clarita: Fulfilling the Dream | The First 30 Years of Cityhood • SCVTV 2018. Historic Preservation Survey & Planning Analysis, City of Santa Clarita • 8-20-2009. Historic Preservation Survey (List Only), City of Santa Clarita • 8-20-2009. 2010 Santa Clarita General Plan (OVOV): Historic Resources • Adopted 6-14-2011. (CURRENT) Historic Preservation Ordinance, 17.03.145 UDC • Adopted 1-8-2013. (CURRENT) List of Structures Designated as Historic • Adopted 11-27-2011. City Council Revises Historic Preservation Ordinance • KHTS 11-28-2012. SCV Open Space Map w/ San Gabriel Mtns Nat Monument City of Santa Clarita 9-22-2014. 1991 Santa Clarita General Plan: Historic Resources • Adopted 6-25-1991, Superseded 6/14/2011. Downtown Newhall Historic Resources Survey & Impact Analysis • Draft March 2005. Downtown Newhall Specific Plan: Eligible/Potentially Eligible Properties • Draft 2005, Adopted 2007, Superseded 2012. City Staff Report: Properties Under Consideration for Preservation (List Not Adopted) • August 2011. Endorsement of HR 4858 (Superseded by San Gabriel Mountains National Monument) 7-8-2014. FULL BOOK - "Santa Clarita: The Formation and Organization of the Largest Newly Incorporated City in the History of Humankind" by Carl Boyer 3rd, Second Edition 2015. LW8501 - Press Kit: City of Santa Clarita Feasibility Committee, 10-14-1985. LW2614 - Santa Clarita Valley City Formation Committee Membership Donation Form, ~1985. LW3197 - Application for the Incorporation of the City of "Santa Clarita," 12-17-1985. LW8602 - Boundary Map of Proposed 90-Square-Mile City, 1-2-1986. LW2612 - Santa Clarita Cityhood Petition No. 000001, 6-29-1986. BW8601 - Pre-Cityhood Chamber Meeting in Pardee House, ~1985-1987. LW2691 - City of Santa Clarita Formation Committee Logo, 1987. GT8702 - Photo Gallery: Santa Clarita Cityhood? First Public Forum, 1-13-1987. BW8704 - Cityhood Campaign Office, 1987. LW3070 - Public Opinion Poll Results: Question of Santa Clarita Cityhood, February 1987. LW3071 - The Case for Cityhood: Formation Committee Addresses LAFCO, 2-25-1987. LW3059 - Arthur Young CPAs Predict 22% Budget Windfall for Proposed City of Santa Clarita, 9-18-1987. LW3072 - Storyboard for Cityhood Campaign TV Commercial, 1987. BW8703 - 1st City Council Inauguration Program Book, 12-15-1987. Audio Recording of First Santa Clarita City Council Meeting • 12-15-1987. Slide Show Presented During First Santa Clarita City Council Meeting • 12-15-1987. LW3060 - City Formation Committee Kicks Off Voter Registration Program to Get More Funds From State, 12-1-1987. BW8702 - 1st City Council-Elect: Darcy, Boyer, Heidt, Koontz, McKeon; November 1987. LW3149 - 1st City Council's New Year's Resolutions, SCV Magazine, Winter 1987-88. SC8801 - 1st City Council, 1987-1990. SC9610 - 5th City Council, 1996-1998. SC9801 - 6th City Council, 1998-2000. SC9611 - Jan Heidt, Santa Clarita City Council Member, 1987-2000. SC9501 - Jo Anne Darcy, Santa Clarita City Council Member, 1987-2002. SC9010 - Carl Boyer III, Santa Clarita City Council Member, 1987-1998. LW2530 - Dennis M. Koontz, Santa Clarita City Council Member, 1987-1990. SC9612 - Jill Klajic, Santa Clarita City Council Member, 1990-1994 & 1996-2000. LW2529 - George Pederson, Santa Clarita City Council Member, 1992-1996. CS9601 - H. Clyde Smyth, Ed.D., Santa Clarita City Council Member, 1994-1998. SC1312 - Frank Ferry, Santa Clarita City Council Member, 1998-2014. SC1311 - Laurene Weste, Santa Clarita City Council Member, 1998—. SC1310 - Robert C. "Bob" Kellar, Santa Clarita City Council Member, 2000—. SC0010 - Cameron Smyth, Santa Clarita City Council Member, 2000-2006, 2016—. SC1313 - Marsha A. McLean, Santa Clarita City Council Member, 2002—. SC1314 - Timothy Ben "TimBen" Boydston, Santa Clarita City Council Member, 2006-2008 & 2012-2016. SC1401 - Dante Acosta, Santa Clarita City Council Member, 2014-2016. SC1709 - Bill Miranda, Santa Clarita City Council Member, 2017—. SC9020 - George A. Caravalho, City Manager 1988-2002. Video - Kenneth R. Pulskamp, City Manager 2002-2012. SC1202 - Kenneth W. Striplin, Ed.D., City Manager 2012—. SC8901 - Grand Opening of Canyon Country Park, 12-1989. SC0100 - First Annual Birthday Run-Walk, 1990. SC9301 - Grand Opening of Begonias Lane Park, 4-24-1993. SC9404 - 1-17-1994 Earthquake: Tent City Hall (21 Views). LW9401 - 1-17-1994 Earthquake: Tent City Hall (4 Views). SC9403 - 1994 Earthquake: Inside City Hall, Multiple Images, 1-17-1994. LW9502 - Formation Committee: Art & Glo Donnelly, Laurene Weste, 1995-96. SC9701 - City of Santa Clarita's 10th Birthday Brochure, 1997. LW3117 - City of Santa Clarita's 10th Birthday Ice Cream Party, August 1997. SC9901 - Map of City of Santa Clarita, 6-11-1999. SC2001 - Photo Gallery: Bridgeport Park Dedication, June 2000. SC0201 - Copper Fire: Central Park Transformed Into Tent City for Firefighters, June 2002. SC0301 - Santa Clarita Aquatics Center Grand Opening, Multiple Images, 10-18-2003. SC0302 - City of Santa Clarita Scrapbook, 1993-2003. SC0501 - Map of City of Santa Clarita, 2005. Amgen Tour of California: A Tale of Two Cities (Santa Clarita, Pasadena) • Road Magazine 2008. SC1204 - City Library's First Chinese New Year Celebration • 1-23-2012. LW2467 - William S. Hart: Detail from Mural at Santa Clarita City Hall • Mural 2000, Photo 2013. TV091613 - Santa Clarita Central Park Phase III Groundbreaking & Construction • 2013. SC1305 - Public Art: "Archways" at McBean Park & Ride, 3 Views • 9-30-2013. SC1502 - Santa Clara River Trail Bridge Installed Over L.A. Aqueduct Pipe • 3-11-2015. SC1708 - Time-Lapse Video: Construction of Connie Worden-Roberts Memorial Bridge at Golden Valley/SR-14 • 2016. LW3165 - Councilman Dennis Koontz with Wicks' "Wiley Canyon Bridge" Cartoon • 12-15-2017. TV1801 - Video: Canyon Country Community Center Site Clearance (Demolition) 3-20-2018. Video: Canyon Country Community Center Groundbreaking • 3-15-2019. SC1806 - Groundbreaking: SCV Sheriff's Station, Golden Valley Road, Photos & Video, 7-25-2018. SC1807 - Groundbreaking: Permanent Fire Station 104, Golden Valley Road, 8-9-2018.